If you were to name three things associated with Newport, chances are they would include beaches, buildings, and beauty. On Saturday, July 28 and Sunday, July 29, enjoy all three at The Newport Show. 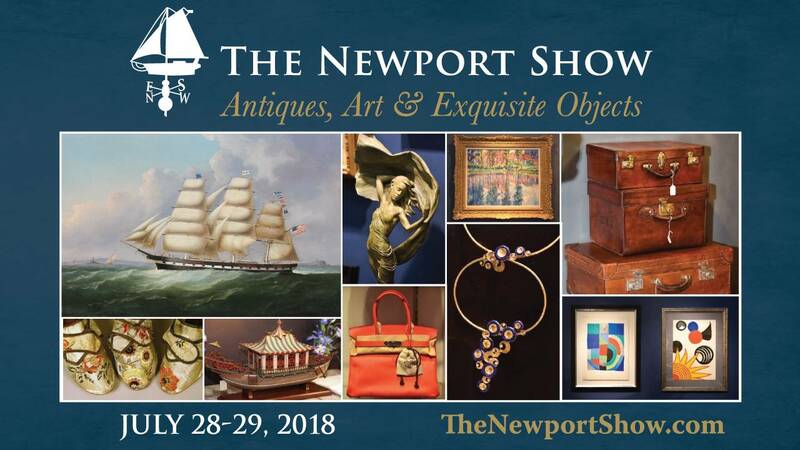 The Newport Antiques Show is a weekend event that has become a high point of the social season and a ‘can’t-miss’ event for fine art aficionados. Every summer since 2007, the ice rink at St. George’s School in Middletown – located on a hill overlooking Second Beach and the Atlantic Ocean – is transformed into an upscale browsing and shopping venue. This year the Show continues its reputation for luxury but adopts a new name, The Newport Show, to better reflect its diverse roster of more than 40 dealers. You can still browse for antique furniture, fine art, jewelry, and other unique vintage accessories, but you can also expect to discover modern objects, photographs, and mid-century art. On Saturday, Patrick Ahearn, principal at Patrick Ahearn Architects, LLC, elaborates on his work in Newport and across New England. His designs and restorations of historic properties incorporate modern technology, environmental controls, and current building codes without sacrificing the building’s historical integrity. On Sunday, Los Angeles tastemaker Cameron Silver traces the history of fashion from 1900-2000. Stylist to Hollywood A-listers and owner for the last two decades of Decades, the vintage clothing boutique on Melrose Avenue, Silver has been credited with sparking the trend in vintage fashion in Hollywood. The annual Gala Preview Party is planned for Friday, July 27 from 6 p.m. to 9 p.m. The Newport Show runs 10 a.m. to 6 p.m. on Saturday, July 28, and 10 a.m. to 4 p.m. on Sunday, July 29. St. George’s School Ice Rink is located at 375 Purgatory Road, Middletown, RI. Parking is free at the Show. Free shuttle service is offered from downtown Newport. Details are on the website. For information and the most recent list of exhibitors, visit www.TheNewportShow.com.